Fully outfitted on site, emergency I.T. office space. Complete with three to 20 workstations (based on needs), VOIP, laptops, laser printer, self-powered, full facilities, includes Mobile internet & WiFi. See brochure for details and unmatched pricing structure. Disaster Recovery is a subset of your Business Continuity Plan. Some of these plans only have tape backups being run or SAN Disk replication. That’s part of the picture; but having a spot to call “home” during one of these events is priceless. Particularly when you know the recovery operation could run weeks or months long with many days requiring all hands on deck for up to 24 hrs. at a time. Many of us have been there and with no “home” to work from, it was that much more difficult. Why would you settle for anything less than having your highly skilled team on-site, collaborating on the recovery process? AMCC provides you with an ideal office environment, on-site, not miles away and with staff on the phone in different counties. You can get your hands on your resources in real time and coordinate the recovery and continuity of your business, even when your data center is under water or worse. 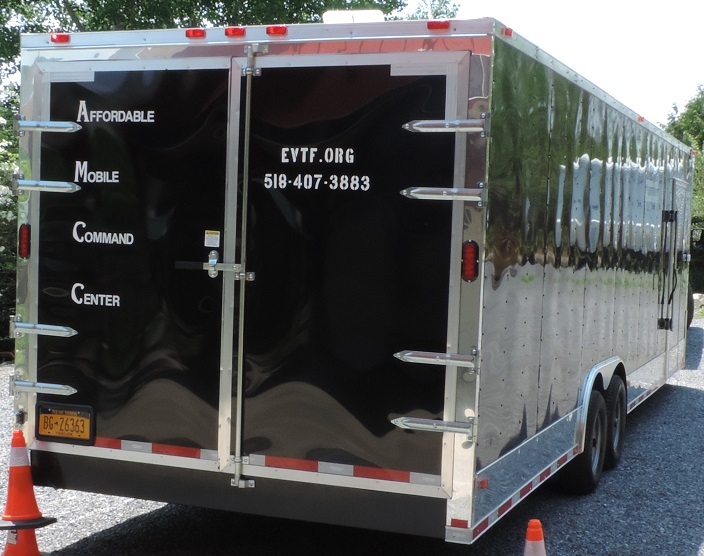 With an on-site mobile command center (AMCC), you’re able to provide more than I.T. infrastructure and support. Business needs can be met once you’ve gained connectivity to your restored backups at your D.R. site. Patient Registrations can take place, historical patient information can be referenced or printed out as needed. Supplies can be ordered and claims processed. After all, returning operations to normal is everyone’s goal during a disaster. When improving the outcomes of your patients is “normal business”, then it’s a very good idea to have all support resources up and functioning. For most facilities, the cost to have this service available is less than $3/day to reserve a Mobile Command Center. Annual validation tests and activation during a disaster are also at reduced rates and unmatched in this industry. We welcome the opportunity for a conversation with you and your team and will be traveling through your area during our 2016 U.S. Tour. Prior tours have been well received and a great opportunity to network, learn, and support our friends in challenged healthcare organizations. If you’d like to learn more about this critical yet affordable solution, please fill out the contact form and we’ll be happy to follow up with you. Visit this page for a virtual tour of one of our units.